I’ve just been reading about St. Anthony of Padua on this, his feast day. While I have known many facts about this revered saint, (primarily because of having served in an Italian parish for eight years) stories at http://www.franciscanmedia.org piqued my interest in going deeper. 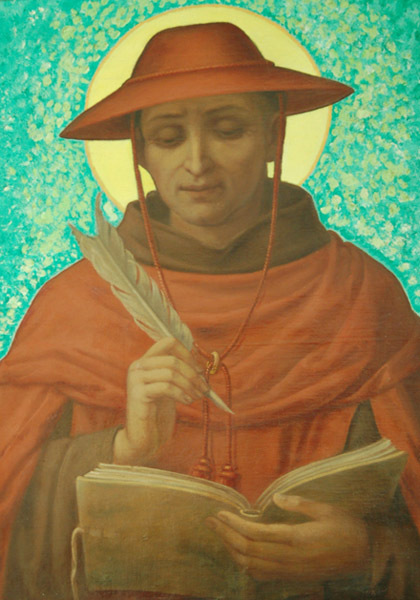 Most of what I read was familiar: the fact that he was born in Portugal rather than Italy, his stint in the Augustinian religious order where his studies gifted him with theological and scriptural prowess before he joined the Franciscan friars, the fact that he was a contemporary of St. Francis of Assisi, etc. There is so much to admire about this saint whose life took many twists and turns in the brief 35 years before his death in 1231. Even Wikipedia was a source for new learnings. The one thing that most everyone knows about St. Anthony is his knack of finding lost things, even to this day for all of us, but today was the first time I read what seems to be the original story of this gift. (Remember that this came from Wikipedia but still…) The incident occurred in Bologna and concerned a favorite book of Psalms belonging to Anthony. It was important to him because of his notes and comments included there which he used to teach his students. It seems that a novice who left the order took it with him. When he noticed that it was missing, Anthony prayed that it would be returned or found and his prayer was answered when the thief was moved to return it. The book is said to be preserved in the Franciscan friary in Bologna. Mystery solved! And aren’t we all grateful for Anthony’s power of prayer! Often when speaking of a very good person, someone will say, “S/he’s a saint!” but when we’re talking about saints in a specific way, we generally look to people who lived in the early days of Christianity or the Middle Ages. Almost everyone knows about St. Francis of Assisi, St. Benedict and (finally!) St. Mary Magdalene, as well as mystics Sts. John of the Cross and Teresa of Avila. Lately, we Catholics in the United States have been gratified with the canonization (official recognition) of Saint Elizabeth Ann Seton, the first American saint, and Kateri Tekakwitha, the first Native American saint. Now there are also “regular people” who have lived a good and holy life who are coming to the notice of people in high places or those whose diligence pleads their case successfully with the Vatican to have them recognized in this special way. One such heroic holy person is Maximilian Kolbe, a Franciscan friar who volunteered to take the place of a Jewish man in the Nazi death camp at Auschwitz. A prisoner had escaped and, in retribution, the commandant announced that ten men would die. Sergeant Francis Gajowniczek was married with a family and lived to tell the tale of the holy man who took his place in the group of ten executed on this day in 1941. Fr. Kolbe was canonized in 1982. Although this heroism was extreme, it was not uncharacteristic behavior for Maximilian Kolbe. His entire life was dedicated to God, most significantly in devotion to the Blessed Mother, Mary. Reading his biography – even the snapshot found on the website http://www.franciscanmedia.org – is inspiring. Most of us will not be called to the kind of heroism that Fr. Kolbe exercised, but we can all aspire to the holiness born of love, willingness and generosity that characterized his life. And in this moment in our complex and dangerous world, we can use those motivations to mitigate the hatred, greed and selfishness that causes the negative energies to rise. May peace reign in our hearts today and lead to peace in our world. Today people all over the world are celebrating St. Pio of Pietrelcina, one of the most controversial and beloved saints in the history of Christianity. Unlike many of those holy people recognized in the Christian canon of saints, Francesco Forgione lived during the life of many of us (5/25/1887 – 9/23/1968). He entered the Capuchin Franciscan order at the age of 15 and took the name of Pio (Pius). He was ordained in 1910. After September 20, 1918, when he had a vision of Jesus and received the stigmata (the wounds of Christ) in his hands, feet and side, Pio suffered for the rest of his life. His deepest suffering came not from the wounds but from the notoriety, the claims that the wounds were self-inflicted, and from the embarrassment and humiliation of the cross he bore. Much of his life was spent in hearing the confessions of penitents and healing people near and far. He was reported to have several spiritual gifts including bi-location and was investigated many times but in the end was found to have been the conduit for many healings and declared a saint of the Roman Catholic Church in 2002. Most notable, it seems to me, is the fact that throughout the long and arduous process and steps toward canonization, there was no treatment of the extraordinary spiritual “gifts” but rather only focus on the verified healings and the holiness of life of this “suffering servant” of God. Much has been written about Padre Pio and he is venerated the world over probably as much for his humility and willingness to be open to the suffering he bore for 50 years as for the image he was of the suffering Christ. We do not understand such happenings, nor should we celebrate or desire the suffering, but in this world of violence and pain in the everyday lives of so many people, we can give thanks for those, like Padre Pio, who do not lose hope in the face of their suffering and who put their faith in the God whose love is enough for them.